Back in Stock provides two main reports to explore your data. The Products report provides an overview of which products have the most customers waiting to purchase. The Customer notifications report allows you to view individual customer notifications. The Product variants report is a great way to review which products are most in demand by your customers. If you have a lot of product variants you can use the search field to quickly find a specific product variant. You can search by either product title or SKU. The product variants report will display a row and totals for each variant. If you'd prefer to see the totals grouped at the product level choose "Group by product" from the dropdown at the bottom of the page. 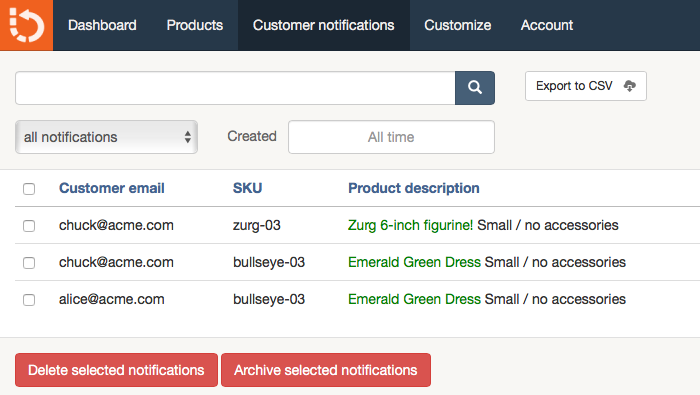 The Back in Stock app provides a tool to view a record of your customer notifications. We may search by customer, by email address, or by product SKU. You can also filter notifications by status ( Sent or Unsent) and date. You can sort the report by date, product, or alphabetically by customer email. You can archive or delete customer notifications by checking the box for that row and clicking Delete selected notifications or Archive selected notifications. Archiving notifications will prevent the customer notification from being sent. An archived notification displays 'Archived' in the report. Archived notifications will not be sent when a product is restocked. They are also not included when display the 'unsent' count for a product variant, such as in the Product report or Most wanted report. Archiving is a good choice if you want keep data in the system but want to prevent a specific notification from being sent. For example, you may have communicated with the customer directly and already sold a similar item, so you know the customer no longer wants to receive the notification. Deleting notifications will remove the customer notification from the system altogether. You can delete a notification if you know you longer want the customer notification request in the system. Deleting it will remove it from the system. When a customer has unsubscribed from a notification it will display Customer unsubscribed. Since the customer has requested to be unsubscribed for this notification it will not be sent. You can't re-subscribe a notification when a customer has unsubscribed, but the customer can choose to create a new notification request from your store product page. Both the Products report and Customer Notifications report may be exported to CSV format, which can then be opened in a spreadsheet such as Microsoft Excel or Google Docs. Click the button labeled Export to CSV and your report will be prepared. It may take a minute or two if you have a large number of customer notifications. You can also receive a Daily or Weekly activity report delivered automatically to your email inbox. This gives you a quick overview of activity for your account in the previous day (or week for weekly reports). Activity reports are only sent when there is activity to report. If you store didn’t record any new notifications, and didn’t send any notifications, you won’t receive a report for that day. 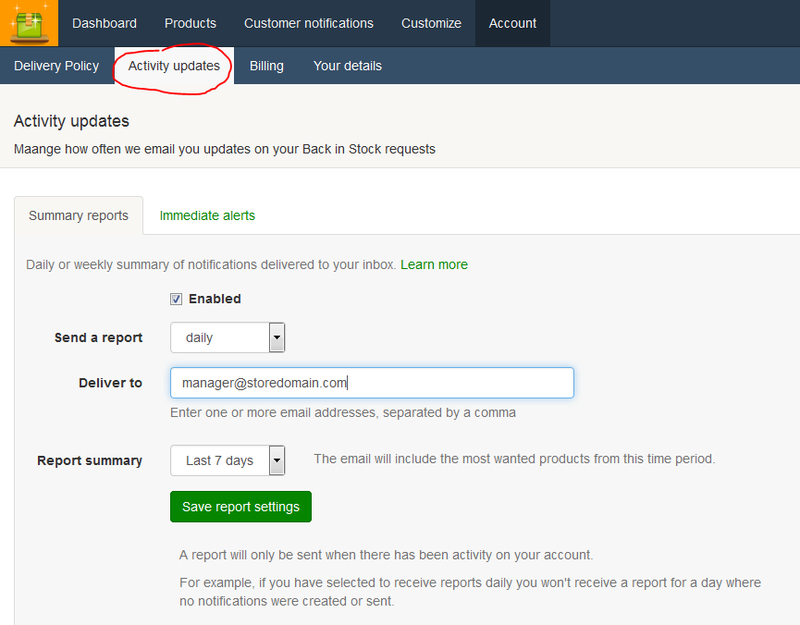 You can setup activity reports from the Activity Updates page. This view allows us to Enable and Configure our Summary Reports to be sent to the email address(es) of our choice, either daily or weekly. 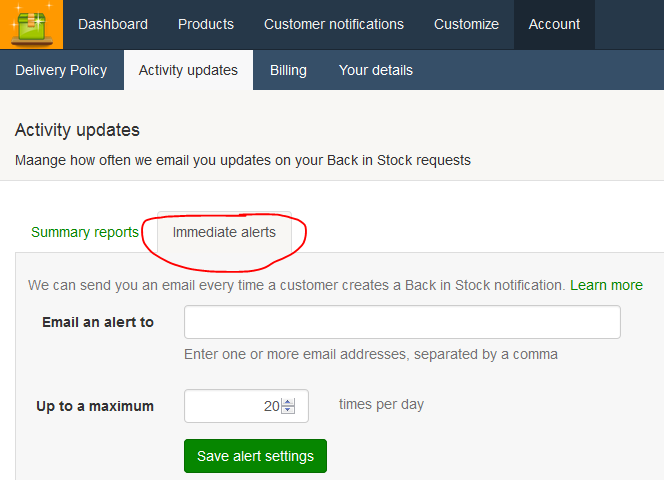 Immediate Alerts become enabled only after at least one email address has been entered and the settings have been Saved. This will send out an immediate email every time that a customer signs up for a Notification for when their item is back in stock. The default setting is for a maximum of 20 such Notifications per day, which can be increased up to a maximum of 100 Notifications per day.